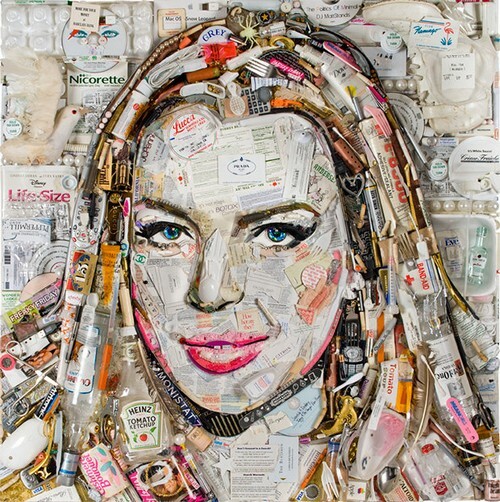 An artist by the name of Jason Mecier took it upon himself to create a so-called artistic piece made out of garbage depicting troubled actress Lindsay Lohan. Go figure. A portrait of garbage made for an actress whose talents amount to garbage. Well played, sir. Several items in the work are even LiLo-related, including the star’s CDs and DVDs and two collectible “Mean Girls” nail files. Some other choice items found within the portrait: jewelry, sunglasses, credit cards, handcuffs, empty bottles of booze, prescription bottles, and Visine. But the list of art supplies gets a little gross from there. Mecier tells omg! he also used Monistat 7, eight Q-Tips, 13 bullet shells, four ant traps, 29 cigarette butts, and even a single tampon. Ew. Does this mean that her career is completely in the crapper? She’s made of garbage in the photo with her insanely inflated lips. How many cigarette and alcohol related items did you find in this trash? Hit the comments and let us know your thoughts on this piece of “art”!